Late last night Justin Oliver won Event #38 ($2500 4-Handed NL Holdem) to win his first career bracelet. The Canadian was able to outlast a tough final field on day #3. Only 8 players returned on day #3, but included John Juanda and David Pham. A total of 566 players joined the 4-handed tournament on day 1, but the action was fast and furious. Yesterday, the first player to be eliminated was Jonathan D’Souza who tried to bluff on the flop, but was called by Pham who had flopped a set of 2’s. Mike DeGilio and Daniel Park were the next two eliminations. The remaining five players moved to the same table and the action started to tighten up a bit because noone wanted 5th place. However, a 3-way all-in pot changed everything. In the massive 3-way pot Nick Schwarmann raised to 32,000, which was called by Pham and Juanda. The flop came Qs/3h/4s and Schwarmann bet 43,000 after Juanda checked. Pham called and then Juanda moved the rest of his chips into the middle. Schwarmann made the call and then Pham also made the call putting Juana and Pham at risk. Juana led the pot with a pair of Q’s, but the other two players both had flush draws. A spade on the river made both flushes, but Schwarmann won with his As/7s. 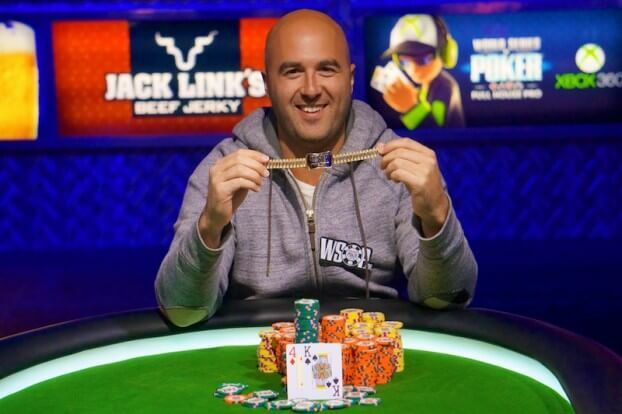 Jared Jaffee was knocked out in 3rd place after Schwarmann hit another flush on the river. Schwarmann had a huge 6/1 chip lead to start heads-up action, but Oliver battled back tough and after 125 hands of HU play Oliver won his 1st ever WSOP bracelet.